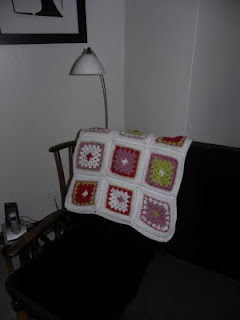 I have to start by admitting to you that I've just completed a little victory lap of the living room punching the air on the way, yes I have finished my granny square crochet blanket. It was a little more work than I originally thought (although I didn't exactly sit down and think about the time when I decided to map this). So about 9 hours and crochet claw hand later here it is, my fabulous granny square blanket. ... and I'm absolutely loving it, although I guess I am a little biased. I have been lucky enough to inherit this beautiful antique wooden 2 seater sofa, think the blanket looks perfect casually looped over the back of it. Not sure how I'm going to feel if someone decides to sit on the sofa with a glass of red wine though. I have at least checked the yarn and it is machine washable, fingers crossed I won't be washing it in the near future. I have been completing these squares on my commute to work each day which leaves me with a quandry for tomorrow morning...might have to read the paper like all the other commuters until I find a new train friendly project. It looks lovely! Having spent many hours working on a project it's always great to see the finished result and more especially so when it looks so good. 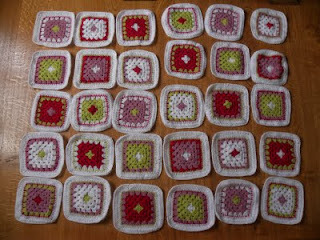 Looks fab, I've still got one of grandma's old crocheted blankets and I can't bear to part with it as its so versatile. You could always take up knitting then no-one will sit next to you!